In 2002, U.S. farmers harvested 2.7 billion bushels of soybeans. Last year in Missouri, farmers harvested 194 million bushels of soybeans worth about $1.2 billion. Now, a team of researchers at the University of Missouri-Columbia is turning those soybeans into gold, with nothing more than a little water. MU researchers Kattesh Katti, Raghuraman Kannan, and Kavita Katti led a team of scientists that have discovered how to make gold nanoparticles using gold salts, soybeans and water. No other chemicals are used in the process, which means this new process could have major environmental implications for the future. Gold nanoparticles are tiny pieces of gold, so small that they cannot be seen by the naked eye. Researchers believe that gold nanoparticles will be used in cancer detection and treatment and in the production of “smart” electronic devices in the computer and telecommunications industry. While the nanotechnology industry is expected to produce large quantities of nanoparticles in the near future, researchers have been worried about the environmental impact of the global nanotechnological revolution. Since a variety of synthetic chemicals are needed to complete the formation of the gold nanoparticles, the MU research team turned to Mother Nature for assistance. They found that by submersing gold salts in water and then adding soybeans, gold nanoparticles were generated. The water pulls a phytochemical(s) out of the soybean that is effective in reducing the gold to nanoparticles. A second phytochemical(s) from the soybean, also pulled out by the water, then interacts with the nanoparticles to stabilize them and keep them from fusing with the particles nearby. This process creates nanoparticles that are uniform in size in a 100 percent green process. The new discovery has created a very large positive response in the scientific community. Researchers from as far away as Germany have been commenting on the discovery’s importance and the impact it will have in the future. “Soy is grown worldwide and Dr. Katti’s Nobel Prize winning discovery will ensure that gold nanoparticles-based Nanomedicine products would be made available even to the less developed regions of the world,” said B. R. Barwale, 1998 winner of the world food prize and founder of Maharashtra Hybrid Seeds Company in India. “Dr. Katti’s discovery sets up the beginning of a new knowledge frontier that interfaces plant science, chemistry and nanotechnology,” said Herbert W. Roesky, a professor and world renowned chemist from the University of Goettingen in Germany. The research team includes Kattesh and Kavita Katti, Kannan, post-doctoral scientists Satish Nune and Nripin Chanda, and Mizzou graduate student Swapna Mekapothula. The research was funded by grants from the National Cancer Institute. Katti recently presented the work at the annual National Cancer Institute Alliance for Nanotechnology in Cancer Investigator’s meeting in October. He also will be presenting the research at the Fourth International Congress of Nanotechnology and the Clean Tech World Congress held in San Francisco in early November. “Dr. Katti’s novel methodology to develop gold nanoparticles with soy will have important implications as the field of nanotechnology blossoms and has greater needs for ‘green’ synthesis of gold based nanoparticles. It is a very important first step,” said Sam Gambhir, director of the Center for Cancer Nanotechnology Excellence at Stanford University. “Dr. Katti’s discovery of green and non-toxic gold nanoparticles is a significant step to help alleviate the pain and suffering of patients with Pseudoxanthoma elasticum (PXE),” said Frances Bernham, president of the National Association of Pseudoxanthoma elasticum. PXE causes changes in the retina of the eye that results in significant loss of central vision. This is pure (99.99%) gold suspended in distilled water. The golds form is colloidal and is measured in microns (millionths of a meter in diameter). The color you see is rather like a shadow of a microscopic view and that shadow confirms the golds presence. In nature only plants can produce gold in such small particles. Our imitation of nature here is to apply high voltage AC current between pure gold electrodes that are submerged in distilled water. The arc exchange suspends gold particulate in the solution.How is it of benefit to people, animals, or any living thing in nature? I personally cannot say yet. Feeling or knowing something intuitively is a far cry from a stack of double-blind, placebo based tests, which I for one, choose never to waste my research time doing, since Ive nothing to prove to anyone other than myself. Drinking the gold solution gives me a sense of well-being and a feeling that Ive gained a higher level of mental clarity. So, although weve only been making and using the gold solution a relatively short while, I already know we will never be without it again. By the way, this capability to imitate natures effect isnt a recent discovery as some may suggest. In modern history, we can drop back 150 years to the genius of the eminent British scientist, Michael Faraday who had quite an interest in liquid gold also. Here, on this site, is a great photo of his work . My little production station is set up next to my computer, so I hear the comforting whisper of the arc as it dissolves and suspends the gold and turns the water a quite unique, most beautiful color of red. Just some of those helps would be truly wonderful. Does it do all that and perhaps more? I can’t yet say, but for me it was worth a serious try and so far I am beyond well-pleased. For health maintenance, many companies on the Internet recommend either half an ounce or an ounce per day. I prefer more. But even use at this reduced rate, price can be a concern, since on the web today the lowest cost is usually about $4 per ounce. Processes to produce liquid gold are not at all proprietary and once the relatively inexpensive initial equipment investment is recovered, the only expense other than labor is equipment maintenance, electricity, steam-distilled water, and the gold. That is why I believe such expense is unnecessary and why weve included this information on this site. There is lots of information on the Internet about dissolved gold, its history, and benefits and I don’t claim to have researched very much of it so far, only enough to convince myself that it was beneficial and safe for my family and friends. There does appear to be some misconception and as in any business arena, there is probably some misrepresentation, though hopefully simply because information was published without adequate knowledge. For example: I dont know why but on the web youll find contraindication for use in the case of Bi-Polar Disorder, and that may be absolutely correct or it may just be an unsubstantiated opinion. The best advice I could give anyone who has the slightest doubt about using liquid gold is to ask a Medical doctor, if you can find one who even knows that gold dissolution for supplemental consumption is possible. This page is to describe a production system that was designed with versatility, repeatability, and safety foremost. It uses a 15,000 volt, low amperage (30 mA) Neon Starter Transformer (NST). There are a lot of thumbnail pictures here with explanations for what you see. Just click on them to enlarge the view and click your back arrow to return. If this page doesn’t answer all your questions, we offer a number of ways to clear up almost anything. This is .9999 pure gold that has been liquefied in distilled water through a high voltage, low amperage application. To produce this small amount required 1 hour and was quite labor intensive. On the right is the same beaker when it had been “brewing” for 30 minutes. Note the small arc which creates the dissolution process. Hi Clay, Though people do get hung up on things like particle size (silly business imho) this is just another fixation borrowed from the world of colloidal silver. Few people may know this but even a poorly made batch of colloidal gold finds a way into your body. I am not an organic chemist or a doctor but I can tell you that the gold does find a way into your body without injection. Nerve tissues have an affinity for gold. It has been used for many years to stain nerve tissues so they can become visible for research. Injection is not only un-necessary it is probably not a good idea. Without the right sterile equipment injecting anything even distilled water can invite dangerous pathogens directly into the body bypassing the usual filters that keep these things out. It may also be useful to know that arthritis treatments that use colloidal gold do not use the gold as the remedy. Gold is a vehicle as it is known to collect in the right places to deliver the ‘drugs’ that are bound to the gold. In many cases these ‘drugs’ have been known to cause problems with other organs, most likely because the gold likes to dwell in these places also. The research with using gold as a delivery vehicle for arthritis drugs have shown that the gold passes from the body in about 30 days. Considering your physical ailment I must clarify some of the ‘beliefs’ about colloidal gold and set some basis for what it may be truly able to effect. A.Colloidal gold isn’t a cure. B.Colloidal gold is non-reactive. Gold has piled upon it many beliefs and claims and I have to tell you that they are generally misguided ( though well intended ) and should be clarified so that we can begin to understand exactly how it can be beneficial and to whom. I can tell you now that gold will not fix your shoulder, can not repair anything. Period. It isn’t working in any chemical reaction that could ‘cure’ something so you may ask, how then can this stuff do anything at all? Allopathic medicine, that is what most of us have been conditioned to ‘believe’ in has missed the physical reality where gold begins to have a meaningful relationship to being healthy. Eastern medicines such as acupuncture focus almost entirely on the same functions of the body that colloidal gold makes its impact known. All medicine should be designed to help the body repair itself. We are conditioned to accept brute force chemical methods that alter the body chemistry,( typically ) as a side effect to ‘cure’ one specific disfunction. Often enough, a powerful result is achieved as the targeted problem is effectively dealt with, at least initially. This brute force, instant gratification has a price and this price can be found in the token 2 pages of fine print that come with any drug you may buy. (with a few 1,000% markup in price) The organic variations in each person are not coherent enough to make a sweeping ‘cure’ for everyone without x side effect. Believe it or not elegant mathematics are employed to help determine this factor moreso than proper drug trials and testing. That’s right, you are a guinea pig and you are paying alot of money for this privilege. The eastern concept of medication boils down to organic components and alterations of the electrical field of the body. The goal is to re-establish the healthy organic electrical and nutritional state and allow the body to do what it does best. Our believe in western chemical treatments has all but ignored the power of the body to heal. The side effects are very often worse than the ‘cure’. Colloidal gold (to finally answer the question, how can gold help you) enhances your electrical flow. Colloidal gold is merely a catalyst to assist your body in working properly. You have no doubt heard ‘ionic’ this and ‘ionic’ that in recent years as it is used as some buzz word to sell products based on some belief system that somehow this ‘ionic’ business has a point. Ionic is probably a poor way of describing an electrical charge though it is accurately used when talking about a solution as the solution is not an absolute the term ionic is used to indicate that in general the solution has an electrical potential. Electrical charge is something that happens in every chemical process and it critical in chemistry though most people probably never think about this fact or understand the relationship between charge and chemistry. It is a fundament to all chemo-kinetics and in chemistry is simply looked at in another way so as to separate the obvious relationship between the electricity and the dynamic chemical exchange. We could say that the electrical exchange in chemical reactions are generally small and the reason for this departure from talking about volts or ampiers is to lend itself to calculations for accurate chemical process so that a specific product and quantity for each stage of a process can be achieved. A fuel cell is nothing more than a chemical reaction and yet is able to store and release considerable electrical potential and power a car. It is all perspective yet, In western medicine the idea that a simple electrical function could help your body heal itself is treated like a myth. The truth is that whatever effects have been claimed over the years about the ingestion of gold all of these reports are the result of either the placebo effect (statistically some results are simply the power of belief) or the direct result of increased conductance in the body. It might sound like a small thing but only because proper research into the direct electrical connection to proper physical order has not been researched and compiled to reflect a better understanding. This brings us to another strong point that has be made. Free will is a vibration. Colloidal gold being an electrical medicine merely helps to re-establish our electrical balance, possibly enhances our electrical capacity and thus our free will. If you understand what it is to be in love, or to be driven by a conviction, face fear, choose not to kill your enemy when you have the upper hand or simply not bother to follow where others take the easy path in life you are a good candidate for free will. There is a good reason that the golden rule is called the golden rule. The idea that a high virtue, (do unto others as you would have done unto you) is given an association with the oldest and most consistent monetary standards this world has ever known suggests strongly that gold has an esoteric value that has been known as long as recorded history. I could go on all night and elaborate on the subject though I’ll save that for future emails. 🙂 Now that you understand from where colloidal gold may have an impact on your physical condition you can remove any false expectation and observe for yourself what it may or may not do for your physical damage. In all truth, even surgery has a limited ability to ‘heal’ it is only a physical correction that is never as good or as permanent as we would like. Other things to consider are actually so simple. Your diet- don’t eat food products with MSG, hydrolyzed oils and other so called ‘safe’ food additives. Drink filtered water or distilled water. Fluoride, so poorly named is actually sodium fluoride and is a toxic chemical industry waste product that has a tremendous negative impact on your nervous system. Seek out alternatives to the western medicine and above all seek harmony in the mind, strike harmony with your environment, within yourself and learn to listen to your body. If this is asking too much, the idea that your life energy, your free will can effect your body then colloidal gold isn’t for you. Get some good medical insurance to help offset the $40,000 or so that it shall cost to have your damage repaired and pay for the overpriced drugs that go with the territory. If you are making use of colloidal gold no doubt other components are being made more useful in helping you feel better, think more clearly and experience a better physical state. Some people choose to be happy no matter the conditions that life places upon them while other people choose to be unhappy no matter what satisfaction is graced upon them. For once, instead of encouraging you to think big, were going to ask you to think small-really small. The field of nanotechnology-the science of controlling materials at the atomic or molecular level-is currently attracting keen interest. New start-ups and scientific discoveries seem to be announced daily, and books and movies on the subject keep popping up. All the excitement about this weird science is motivated by the promise of faster computing, better medicines, and smarter products. Some aspect of nanotechnology has been used to create products in markets as diverse as the building, electronics, cosmetics, food, and pharmaceuticals industries. Which begs the question, What is the potential impact of nanotechnology on the jewelry industry? The short answer is that nanotechnology has already penetrated the jewelry industry in many forms, discreetly playing a useful role in a number of applications-especially with respect to precious metals. But its really only scratched the surface. Theres much to come! Nanotechnology was officially born in 1959, when renowned physicist Richard Feynman gave a lecture in which he predicted that, sooner or later, engineers and scientists would find ways to build really tiny structures, machines, and devices out of individual atoms and molecules. Not much happened until 1981, the year Nobel prize winners Gerd Binnig and Heinrich Rohrer demonstrated their scanning probe microscope. This remarkable tool allowed technologists to poke and push individual atoms and molecules. The device was used in an early attempt at nanoscale advertising, in which the initials of a well-known computer company were spelled out on a flat surface using a dozen or so atoms of the inert gas xenon. FIGURE 1: A molecular simulation of a gold slab with an attached organic molecule shows individual atoms and their associated electrons. Up until that time, the common tools of chemistry, such as the analytical balance, spectroscopy, and X-ray diffraction, were not particularly useful for studying structures at the nanoscale, so the availability of the new equipment really got people thinking. Interest in nanotechnology has grown enormously since then, as revealed by a casual search on the Internet. There are many aspects of nanotechnology that are attracting interest, particularly in the fields of biotechnology and chemistry, but here I will focus on the very special role that the precious metals gold, silver, and platinum have in the field. Put the terms gold and nano into the Google search engine and youll be swamped by nearly half a million hits. The reason for this phenomenon is explained below. First of all, lets clarify the term nanotechnology. A nanometer is one billionth of a meter. About four gold atoms lined up side-by-side make up a nanometer. We cant see an atom because it is too small for the properties of surface and color to have any physical meaning, but we can create images showing some aspect of its presence, such as its electron density (figure 1). A troy ounce of gold contains about 95,090,000,000,000,000,000,000 atoms of gold, a number so big that its beyond human conception. I will try to put it into perspective. A typical period at the end of a sentence is about 300 micrometers in diameter. This is already pretty small. A little machine the size of a period would be amazing. But this is not nanotechnology. Although a bacterium cell is 100 times smaller than a period, we need to go 1,000 times smaller than even the cell-so small that the nano-thing is to a single bacterium cell as the period is to us. That is the nanoscale. We can broadly define nanotechnology as the business of making, studying, and exploiting useful nanoscale structures. Matter behaves rather differently at the nanoscale. For example, interatomic interactions and factors that are quite unimportant at macro-scales become dominant at the nanoscale. In addition, many material parameters change markedly from those of a bulk material. Part of the excitement about nanotechnology is motivated by the observation that control of matter at the nanoscale is the key to faster computing, better medicines, materials with in-built functionalization (so-called smart materials), and new and exciting properties. Unfortunately, there is a lot of hype around nanodevices and nanotechnology, much of it initially stimulated by certain futuristic predictions of self-replicating nanorobots and now perpetuated by a progression of new startups, some offering hypeware of the most improbable nature. I want to emphasize that at this stage scientists do not know how to design, make, power, and actuate self-replicating nanobots. (Person-ally, I think we have many more important issues in our lives to worry about than this distant possibility.) However, there are many genuine areas in which the application of nanotechnology has led, or will in time lead, to socially significant breakthroughs in the areas of medicine, solar energy, pollution abatement, computing, materials of construction, textiles, domestic hygiene, and biotechnology. For example, the idea of using tiny gold nanoparticles to selectively target and destroy cancer cells is currently receiving a lot of attention, and some therapies are already in the first phase of testing. The U.S., Japanese, and EU governments have earmarked billions of dollars for nanotechnology research-and a commitment that big is always matched by the expectation of meaningful returns. As mentioned previously, nanotechnology involves assembling individual atoms or molecules in-to useful nanoscale structures. It turns out that this is very hard to do with metals in general because they oxidize rapidly under atmospheric conditions. For example, a nanoparticle of iron becomes a particle of iron oxide rust in only a few seconds. Although some metals can be protected for a while by the formation of a thin oxide film, its better to use metals that are inert in the atmosphere-and what finer example is there than gold? Thousands of technologists have independently arrived at this conclusion. As a result, gold particles, wires, and surfaces are at the heart of much of nanotechnology. At this scale, the inherent softness of pure gold is not an issue, nor is its high intrinsic value. In addition to resistance to corrosion, golds electrical conductivity and special affinity for sulfur-containing organic molecules are also particularly attractive features. These properties allow chemists to design molecules that can stick onto the gold in a controlled fashion, and then be probed by electrical currents. This permits the bottom-up assembly of quite interesting and promising structures, such as ultra-sensitive biosensors. However, gold also offers many of the top-down fabrication advantages of silicon, and it can be processed using electroless or electrolytic deposition, lithography, and etching-techniques that are all familiar to the worlds huge integrated circuit industry. Regrettably, no simple way of making gold nano-wires has been found-yet. It is important to note that the relatively high value of gold is not expected to impede its penetration into the high tech markets. The value of the tiny amounts of gold used in existing or anticipated nanotech products is completely swamped by the overall added value of the product. Manufacturers will use gold when it provides the best technological performance, and they will not be overly concerned by its price. A $20 medical test kit or sensor might contain gold worth only 50 cents, yet it may be this critical ingredient that makes the whole device possible. In any case, gold is far cheaper than the highly touted carbon nanotube, the other material frequently associated with nanotechnology. Single-wall carbon nanotubes cost $400 per gram when in reasonable purity. The cost increases to $1,500 per gram or $46,000 per troy ounce for highly processed carbon nanotubes. Gold is a bargain compared to this. In the bulk form, gold is a soft, yellow metal with a face-centered cubic crystal structure, a melting point of 1,064°C/1,947°F, and excellent electrical conductivity. However, not one of these facts necessarily applies at the nanoscale. Similar odd behavior is observed in most other elements and compounds. The new properties and phenomena occurring at the nanoscale are some of the things that the practitioners in the young field of nanotechnology seek to exploit. Here we will have space to explore only a few of the areas of nanotechnology that might impact the jewelry industry, and I will say little about the very significant applications of precious metal nanoparticles in chemical catalysis, biosensors, and the electronics industry. # Strange colors. One of the features of gold and silver nanoparticles is that they possess a range of quite unusual colors. Bulk gold has a familiar yellow color, which is caused by a reduction in the reflectivity of light at the blue end of the spectrum. However, if we subdivide the gold into smaller and smaller particles, there comes a point at which the particle size becomes smaller than the wavelength of incident light. New modes of interaction between the radiation and the gold become prominent, in particular interactions involving electronic oscillations called surface plasmons. When the particles of gold are small enough, they are ruby red in color. This coloration is due to the gold particles strong absorption of green light, corresponding to the frequency at which a resonance occurs with the gold. FIGURE 2: Glass coated with specially aggregated gold nanoparticles has a pleasant bluegrey hue and can block heat from the sun. This effect has been used to color glass, even as far back as Roman times. However, it is a transmission color; if the same nanoparticles are viewed in reflected light, they will appear orange or green-brown. This gives an interesting color-shift to translucent artifacts colored with metallic nanoparticles. These colors may also be readily varied by adjusting the shape or state of agglomeration of the metallic nanoparticles. A particularly useful color change is produced when discrete gold nanoparticles agglomerate into groups that resemble bunches of grapes. The color of a suspension or coating of such particles changes from burgundy to inky blue. This phenomenon has been invoked as a colorimetric indicator in home pregnancy tests and in testing for specific genetic sequences. It is currently being researched as the basis for solar screen coatings for windows (figure 2). Some idea of the range of colors possible with gold is shown in figures 3 and 4. Actually, many other metals besides gold and silver display this type of spectrally selective resonance, too, but in general the resonant frequency lies out of the visible range, in the ultraviolet. Furthermore, gold is one of the very few metals noble enough to survive as a nanoparticle under atmospheric conditions. This serendipitous combination of properties has encouraged its use in a diverse range of niche applications. Can these strange colors be exploited in a jewelry application? The jury is still out on this question. Certainly, to be of value in fine jewelry, the karatage of the colored gold should be high. This probably excludes many of the commonly prepared colored glasses as possible materials from which to produce a piece of jewelry. But it is worth noting that, in theory, interesting colors are possible up to about 23 karats. This is because of the high density of gold relative to the various candidate transparent matrix materials. The trick will be to find a matrix to hold the precious metal nanoparticles. However, the availability of gold gilding pastes and paints of very high metal content shows that there is no theoretical limitation that prevents this possibility. Watch this area for future developments. # Anomalous bulk properties. Bulk gold melts at 1,064°C/1,947°F. On the other hand, the melting point of gold nanoparticles can be as low as 300°C/572°F. This phenomenon is the result of the huge increase in surface area of gold nanoparticles. However, it seems that the exploitation of this property for jewelry manufacturing, such as making gold solder, is not easy. As soon as two molten nanoparticles of gold touch, they weld together and merge. This decreases their surface area and causes them to freeze again. On the positive side, the strength and toughness of metals can be enormously enhanced if they are made out of nanoscale crystallites rather than the usual micron-size grains. This effect is already widely exploited to make superior ceramics and tungstencarbide-cobalt composites. There is a similar effect in metal systems. Nanocrystalline copper, for example, is as hard as fully cold-worked copper, yet it retains a significant degree of ductility. Full exploitation of this phenomenon has yet to take place in the jewelry industry. FIGURE 3: Dispersions of discrete gold nanoparticles in transparent media have an interesting and flexible color gamut that has only recently been exploited for paints and coatings. These colors depend on how the particles are viewed and on their shape. The gold particles in the test tubes above are being viewed in transmitted light. # Coatings de luxe. Nanotechnology need not be applied in a bulk material only. It can also be applied within a coating of some kind. Of course, as a general rule, the precious jewelry industry is not keen on coatings, preferring instead that jewelry products be based on a combination of high value bulk materials and excellent design. Certainly, coatings in high wear regions of a piece are especially problematic if their slow removal is associated with a color change. Nevertheless, in low wear products, such as pendants and earrings, nanoscale coatings of colored compounds of precious metals are definitely feasible. As mentioned in a recent MJSA Journal article by Dr. Christopher Corti (Breaking Tradition, July 2004), colored gold coatings are already on the market in a limited way. Purple gold, AuAl2, may be the best known coating. It can be deposited onto an 18k substrate to yield patterns or swirls of purple that are hallmarkable as 18 karat in their own right. Bulk AuAl2 is relatively soft and brittle, and it should be treated in use as one might treat a pearl. On the other hand, a nanoscale coating of AuAl2 is both durable and attractive. It can be readily prepared by physical vapor deposition (a clean, dry vacuum method in which a work piece is subjected to plasma bombardment to ensure a dense, hard coating) onto a suitably cleaned substrate, and it must be only a few tens of nanometers thick to yield the desired color. The best method seems to be to codeposit the gold and aluminum simultaneously, as this application can be tailored to yield the purple color without any further requirement for heat treatment. There are other more exotic possibilities in the pipeline. For example, some way to impart scratch-resistance to lustrous polished surfaces of gold or platinum alloys would be of great interest. In general, the various techniques developed to date have focused on increasing the hardness of the bulk alloy, with some attendant complications regarding subsequent manufacture. An alternative line of thought is to apply a nanoscale coating of a hard, transparent compound to the jewelry piece. Chemical vapor deposition diamond films are one candidate for this application, but there are many practical problems to be solved before this would become generally feasible. However, some lesser-known nitride compounds of the transition metal elements seem to offer interesting prospects for high hardness in a coating that is too thin to materially change the karatage. Unfortunately, the best known compound, titanium ni-tride, has a strong golden color of its own that would mask the color of the underlying precious metal alloy. Time will tell if a hard, transparent alternative can be found. The whole point of nanotechnology is that it is becoming possible to make useful, functional devices that are smaller than anything ever made before. Will there be a general trend toward integrating some technological devices into items of jewelry? It is certainly becoming possible. Candidate functionalities include bracelets that could record their owners blood pressure and heartbeat, or a pendant that could include cell phone capabilities. There are problems of hallmarking, of course, and no doubt many would see such items as tawdry. However, a small market already exists for color-change and other novelty jewelry, so it is possible, for example, that an integration of electronic smarts with a gold nanoparticle color change functionality might appeal to some markets. 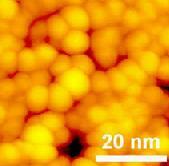 FIGURE 4: The same gold nanoparticles shown in figure 3 are pictured here in reflected light. 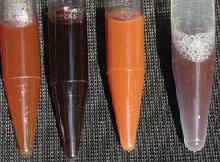 Contents of test tubes one and three (from left to right) are now a golden-orange. Tube two has become inky-purple, and tube 4 a light purple-pink. In this article, I have only skimmed through the subject of nanotechnology and its potential application to the world of jewelry. The emphasis here has been on showing how and why materials and phenomena are different at the nanoscale, and how this affects the properties of the precious metals. Gold, in particular, has a special place in nanotechnology due to its nobility. In addition, it has a variety of unexpected nanoscale properties that are not observed at the macro-scale. The strange and variable colors of gold nanoparticles are particularly interesting and may offer creative possibilities for an adventurous designer. Thanks to NDC from Ormus yahoo group for the link, and for is detailled information on the Philosopher Stone, at alchemyisreal.com …. Not everything in your solution is fully dissolved to the atomic level !!! Understanding Colloidal Suspensions is actually understanding the “Electro-Magnetic World” of Your Plant Food Solution.The Electro-Magnetic and Electro-Mechanical forces, generate the dynamics of your solution. It is the “Electric World” that allows atoms to form molecules. This Binary World of plus ( + ) and minus (  ) electrical tensions, allow the formation of the “Dance Circles” we call Molecules. This force acts like springs connecting the various atomic nuclei and suspended particles. Any movement in this spring, we call Heat . The condition of no movement, we call Absolute Zero ( = the condition of no heat ). I strongly suggest you read, “Control of Colloidal Stability by Zeta Potential” http://www.hbci.com/~wenonah/riddick/index.html , by Thomas M. Riddick. The two plants at the top went 148 days in water with NO nutrients added. Continued to blossom, lose blossoms, grow new buds and flower; no roots. At the bottom are Coleas, full grown, very woody. Root growth shown took six days and roots were not only growing in the water but in the air over the water. – National Dictionary  1941 Edition : COLLOID  a substance such as gelatin or starch, which apparently dissolves in water, but which diffuses slowly, if at all, through a membrane; a gelatinous substance secreted in certain diseases. A solid, liquid, or gaseous substance made up of very small, insoluble, nondiffusible particles (as single large molecules or masses of smaller molecules) that remain in suspension in a surrounding solid, liquid, or gaseous medium of different matter. A state of matter consisting of such a substance dispersed in a surrounding medium. All living matter contains colloidal material, and a colloid has only a negligible effect on the freezing point, boiling point, or vapor tension of the surrounding medium. The material within which the thyroid gland stores its hormones: it is a protein containing iodine. – Handbook of Chemistry and Physics  Forty-forth edition, printed May, 1963: Colloid.  An entity phase dispersed to such a degree that the surface forces become an important factor in determining its properties. In general particles of colloidal dimentions are approximately 10 angstroms ( 109 m ) to 1 micron ( 106 m ) in size. Colloidal particles are often best distinguished from ordinary molecules due to the fact that colloidal particles cannot diffuse through membranes which do allow ordinary molecules and ions to pass freely. # Colloidal Suspensions: From Rockefeller Center Weekly 1Q35, Center Publications, Inc.  Oct. 1935 ; Published Readers Digest, March 1936, as “Chemistry’s Miraculous Colloids”. At the time of publication of Alexander’s “Colloid Chemistry  Volume 2” in 1929, great advances were being made in biology, agriculture and medicine with colloidal suspensions. A group of executives sat tense and silent in an office in the RCA Building in New York City. They stared with incredulous eyes at a purple orchid. A short time before it had been rescued, a withered, yellowed thing, dead. Now the petals were fresh and crisp, its color vivid. It was blooming with new life, and would continue to do so the next 16 or 17 days. Dr. Frederick S. Macy, one of the country’s outstanding bacteriologists, had added a teaspoonful of an amber-tinted liquid to a quart of water in the bottle, which held the flower. Here was a striking indication of the mysteries that lie ahead in the comparatively unexplored realm of science known as colloidal chemistry. systems of organized dancers. The dancers are the many Atomic Forms existing on this planet. Their inter-weaving “Circle Dances”, form our bodies and our material world. – Introduction : The study of chemistry is primarily focused on ionic chemistry, ( i.e. ) the action of chemistry on solutions. Ion.  An ion is an atom or group of atoms that is not electrically neutral but instead carries a positive or negative electric charge. Positive ions are formed when neutral atoms or molecules lose valence electrons; negative ions are those which have gained electrons. Metals, minerals, inorganic materials, proteins and amino acids are held in suspension in liquids and not solution. They are microscopic and submicroscopic particles like dust particles in the air. These very small particles are called colloids. Metallic Elements in general are distinguished from the non-metallic elements by their lustre, malleability, conductivity and usual ability to form positive ions. Over 80% of the elements in the periodic table are metallic in nature. In order for a material to have metallic properties, electrons must be free to run throughout the Lattice Structure. And in order to have a lattice structure, there must be multiple atoms to form a crystalline like structure. So, a single or a few atoms do not have a lattice structure and therefore do not manifest metallic properties. Non-metallic Elements are not malleable, have low conductivity and never form positive ions. Metals.  It takes a twelve-atom cluster before they become electrically conductive. It takes thirteen atoms for their true metallic properties to begin to appear. It takes a cluster of thirty-three atoms before they become fully metallic, and will grow all by themselves. At thirty-three they form a “face center cubic”, a first basic growth structure of three dimensions solidly formed like a cube. Minerals.  Many minerals will be going into and out of solution, depending on solution concentration, etc. The result is many microscopic crystals of the mineral in suspension. Salt.  Any substance which yields ions, other than hydrogen or hydroxyl ions. A salt is obtained by displacing the hydrogen of an acid by a metal. Since colloids in suspension form chemical compounds like ions in solution, the suspension characteristics of colloids are generally ignored. Colloids are held in suspension via, a very slight Electro-negative charge on the surface of each particle. This charge is called Zeta Potential. The ability of a liquid to carry material in suspension is a function of these minute electrical charges. As the Electro-negative charge increases, more material can be carried in suspension. As the charge decreases, the particles move closer to each other and the liquid is able to carry less material. There is a point where the ability to carry material in suspension is exceeded, and particles begin to clump together with the heavier particles materials dropping out of the liquid and coagulating. This phase change is quite similar to temperature variation in water. Just as a 10-degree temperature shift in water has no significant effect at 70 degrees F, but a major effect at 35 degrees; so, it is with colloids in suspension. Each liquid has a phase change point where very slight changes in the Electro-negative charge can produce large effects. This whole area of study is known as Colloidal Chemistry, Physical Chemistry, Surface Change, or Zeta Potential. It is a mixture of both physics and chemistry. # Mechanisms of Action and Influencing Factors : Colloids in suspension determine the ability of all liquids particularly water-based liquids to carry material. This also applies to semi-solids and solids but liquid is the focus of this paper. The ability to carry material or a carrying capacity of a liquid is influenced by composition, surface tension, centrifugal and centripetal motion, polarized light and magnetic fields. – Basic Elemental Composition: All elements, except the noble gases with no valence, are either Electro-positive or Electro-negative. The relative quantity of positive and negative charge in a liquid determines carrying capacity. Electro-positive ions decrease carrying capacity while Electro-negative ions increase it. Elements with only one positive or one negative ion have little effect on suspensions. Elements with two positive or two negative ions ( divalent ) such as magnesium and beryllium ( +2 ) or oxygen and selenium ( 2 ) have 3,000 times more effect on carrying capacity than elements with single ions. Elements with a valiance of three, such as iron and aluminum ( +3 ), nitrogen , and phosphorus ( 3 ) have 6,000 times more effect on carrying capacity than an element with a single positive or negative ion. It follows that the addition of a very small amount of an element with three positives or three negative ions ( trivalent ) can have a massive effect upon carrying capacity particularly near the phase change point. – Surface Tension: Surface tension is a measure of the adherence of a material to itself, the tenacity with which it resists expansion and the attraction between molecules. In water, the mechanism allows a needle to float on top or an insect to walk across it. Some general rules are: if carrying capacity increases, surface tension decreases; if carrying capacity decreases, surface tension increases. Surface tension and particle charge are most easily understood if we think of positive charges and increased surface tension as binding together or concentrating and negative charges and decreased surface tension as expanding or dissipating. The greater the surface tension and the lower the Electro-negative charge, the more any material, such as water, will bind together and coagulate or concentrate. Adding a surfactant ( a surface-active agent ) such as detergent can decrease surface tension, but this will not increase carrying capacity unless it changes the basic colloidal chemistry of the liquid by adding a material with negative ions. Surface tension and Zeta potential are not strictly related. In addition, a surfactant can decrease surface tension ( good ) but also move Zeta potential to a lower Electro-negative number. In many cases in aqueous solutions, increases in the Electro-negative charge, i.e. Zeta Potential will decrease surface tension. Oxygen http://www.hbci.com/~wenonah/hydro/o.htm is highly paramagnetic; ( attracted to a magnetic field, but not magnetized ). Hydrogen http://www.hbci.com/~wenonah/hydro/h.htm is highly diamagnetic; ( repelled from a magnetic field but not magnetized ). Under normal circumstance, these are such weak forces that they are not considered significant. In vortex flow, they have a more significant effect. When passed through a strong magnetic field http://www.hbci.com/~wenonah/new/magnetic.htm , oxygen molecules tend to be attracted towards the field and hydrogen molecules repulsed from the field. Water http://www.hbci.com/~wenonah/hydro/h2o.htm is one atom of oxygen and two atoms of hydrogen. The two atoms of hydrogen make it diamagnetic.Water has two single plus ions from hydrogen and one divalent negative ion from oxygen ( 2 ). The divalent Oxygen has 3,000 times the effect on carrying capacity and Electro-negativity as the single plus charges of hydrogen ion; thus, water has a slight Electro-negative charge. Mini-Vortices  The bubbling air into water and turbulence create multiple mini-vortices. This has a direct influence upon the carrying capacity of a liquid. Generally, bubbling air introduced under the water surface will decrease surface tension depending on the direction of rotation. – Substances in Colloidal Suspension: Substances in colloidal suspensions, even in quantities far above the recognized lethal level, have few toxic effects. Fish, for example, will survive and thrive in water with six times the lethal concentration of lead, arsenic, and many other substances considered toxic if the water has the right charge and the material is in colloidal form. In non-colloid form, fish death is rapid at far lower concentrations. The reason is beyond the scope of this paper but living systems can take what is needed from colloids and pass the rest with little harm. If surface charge and carrying capacity are degraded, colloids begin to clump together into larger and larger ( although still microscopic ) particles. BThe electrical charge is a function of the total surface area of the particles. A one-inch metal cube has a surface area of 6 square inches. Divide it into small colloids and the area increases to over 5 million square inches each with a small electrical charge. Reduction in the surface charge first causes gentle settling of small particles, as colloids lose enough charge to clump and settle out of the liquid. The heavy metals generally come out first and symptoms of heavy metal poisoning http://www.hbci.com/~wenonah/hydro/heavmet.htm may appear. As surface area and charge decrease, the larger particles bind to receptors, preventing chemical release at the synapse, which may be disguised as mental, emotional or physical problems. The process is little different from scale forming in pipe. Arterial sclerosis is another example. As the carrying charge of the blood is reduced, material deposits on the artery walls, just as scale does on the pipe. Obviously, lead http://www.hbci.com/~wenonah/hydro/pb.htm , arsenic http://www.chemicalelements.com/elements/as.html , cadmium http://www.hbci.com/~wenonah/hydro/cd.htm or other trace, heavy metals in a living system http://www.hbci.com/~wenonah/toxic.htm react the same. As the electrical charge drops, they are no longer colloids, settle out and clump at receptors. Reduction of the carrying charge now appears as lead or other heavy metal poisoning. Lead poisoning or other heavy metal poisoning is an effect not the cause. The cause is the reduction in carrying charge. The amount of lead may be the same over the whole life span and may not manifest itself until other factors reduce the total system charge. Children are particularly susceptible http://www.hbci.com/~wenonah/new/childtox.htm to such poisoning. The primary cause may be early vaccination ( aluminum stabilizers used in vaccines ) coupled with reduced carrying capacity from the parent aggravated by the food and water supply. FDA estimates of dietary intake for six, the 11-month-old child of .7 / gm per day, grain are undoubtedly low. Vaccines, allergy skin tests, 25% human serum albumin, baby skin creams ( stabilized with aluminum ), and prenatal IVs, baby diaper wipes and antacids which are frequently given to infants in an IV are extremely high in aluminum. For adults, the accumulation continues, from suntan lotion, cookware, aluminum cans and skin moisturizers. Deodorant, vaginal douches and baby wipes are not only high in aluminum but are applied to areas where there is far greater tendency for absorption through the skin. The reduced surface charge can manifest as symptoms of degenerative disease like osteoporosis. The cause is not calcium intake. The cause is reduced carrying capacity, which destroys the blood’s ability to carry minerals in suspension to bone. Heart attacks are another example of blood suspension being reduced to the phase change point where any stressor will trigger massive coagulation. # SUMMARY : Understanding of the basics of surface charge and the factors affecting it opens new insights to reversing our environmental problems, health http://www.hbci.com/~wenonah/new/mcdaniel.htm and water treatment. Many manufacturing processes can be modified and simplified with these understandings. The detailed interactions of various colloids in solution are far more complicated and sophisticated than they appear here but the principles are simple. While colloidal chemists understand in detail the actions of colloids in solution, the understanding of the factors enumerated here, which affect them and the principles on which they are based is missing. Atmospheric Spraying and Well depth  Atmospheric spraying such as in irrigation, decreases the carrying capacity due to the mixing of carbon dioxide in the air ( 0.03% ) with the liquid, this reduces pH. The amount of solids in water increases in strata with the depth of wells. pH http://www.hbci.com/~wenonah/hydro/ph.htm is a measure of how acid or alkaline a substance is. pH 7 is balanced, equally alkaline and acid. As pH becomes more acid ( down to pH 3 ) carrying capacity decreases. As pH becomes, more alkaline ( up to pH 11 ) carrying capacity increases as a result of the increase in hydrogen ions. This varies a great deal depending on what elements are in solution. Alkalinity and surface tension changes are a result of changes in hydrogen bonding in water. # Electromagnetic Radiation : Certain electromagnetic radiation frequencies decrease the carrying capacity. While there are many frequencies not yet measured, 60-cycle alternating current will produce a decrease in carrying capacity. Since carrying capacity is a function of the Electro-negative charge on particles, it is possible to artificially increase and create a higher Electro-negative field which will temporarily ( up to about 8 hours ) increase or decrease the carrying capacity of a liquid. The nature of the charge on these particles is essentially an electrostatic one similar to the charge that builds up on the body when walking across a carpet that creates a spark when metal is touched. During the time this artificial increase is present, the particles in suspension react as if the basic chemistry was changed. The carrying capacity will increase and the surface tension will decrease. When the artificial charge on the particles dissipates however, the carrying charge of the liquid will theoretically return to the same carrying charge as before the charge was increased. In essence, it will relax back to the original values. In actual practice, this rarely occurs. During the time the carrying capacity is higher and the surface tension is lower, the liquid will have dissolved more material into solution due to the higher wetting action, the ability to penetrate through smaller pores and increased capillary action resulting from the lower surface tension. More material is likely to be in suspension, picked up and carried while the increased carrying capacity was higher from the higher surface charge. When the liquid relaxes as the artificial field dissipates, these additions may have changed the chemical composition, and the particles will find a new equilibrium point which may be higher or lower depending on the particles which have been taken into suspension. If the artificial charge is maintained at a constant level, the effect is little different than changing the basic chemistry. Despite the number of references to aluminum toxicity, the FDA has always exempted it from testing from testing by putting it on their “Generally Regarded as Safe” ( GRAS ) list. Aluminum can be added to foods, medicines or water without restriction from the FDA. The mechanism of action of aluminum toxicity is aluminums effect on carrying capacity or Zeta Potential. Aluminum is relatively non-toxic in and of itself. However, it destroys the carrying capacity of a liquid. Aluminum has three ( 3 ) positive ions, so a single ion of aluminum will reduce surface charge, reduce carrying capacity and increase surface tension by 6,000 times the amount that an ion of Sodium, which has one ( 1 ) positive charge, would. Aluminum remains tightly bound in soil and metal except in acid conditions. Acid conditions cause the ions of aluminum to leech into surrounding material, thus impairing or destroying the carrying capacity of the water to carry nutrients. The simplest illustration is with plants and trees. As aluminum is either leached from the soil due to ( low pH ) acid rain introduction from piping and certain fertilizers, it then impairs or destroys the ability of water to carry nutrients throughout the plants and trees. Minerals, proteins, amino acids and some hydro-oxides are all directly affected. When the carrying capacity and / or surface charge is significantly reduced nutrient flow to the plants and trees ceases. It makes no difference how much of the nutrient is added to the soil ( unless it is an Electro-negative nutrient ), if water cannot carry it into the plant. The most common agricultural solution is to add lime to increase the pH. Increasing pH is treating a symptom not the cause. The degradation is further compounded by the increased surface tension, which does not allow water to flow through small pores and capillaries. The discussion and concern about acid rain in the northern forests is not an acid rain problem, but rather a problem of lowered pH from acid rain that leaches aluminum into the soil and reduces the Zeta Potential. The ions of aluminum get into surface water, reduce the carrying charge ( ZP ), and increase the surface tension creating a devastating effect on forests. There are many, obvious simple solutions to this problem once the mechanism is understood. Gold nanoparticles are highly efficient and sensitive “handles” for biological molecules being manipulated and tracked by lasers, but they also can heat up fast–by tens of degrees in just a few nanoseconds–which could either damage the molecules or help study them, according to scientists at JILA, a joint institute of the National Institute of Standards and Technology (NIST) and University of Colorado at Boulder. Biophysicists often study nanoscale and even picoscale mechanics by using lasers to both apply force to and track the position of fragile biomolecules such as DNA or protein by manipulating a tiny sphere–typically polystyrene–attached to the molecule. The JILA team would like to find new microsphere materials that can be trapped by laser radiation pressure more efficiently, which would enable faster measurements and detection of smaller motions at the same laser power. As described in the Aug. 15 issue of Optics Letters,* the JILA team demonstrated that 100-nanometer-wide gold beads, as expected because of their metallic nature, can be trapped and detected six times more easily than polystyrene particles of a similar size. However, the scientists also found that gold absorbs light and heats up quickly, by a remarkable 266 degrees (Celsius) per watt of laser power, at the wavelength most often used in optical traps. Unless very low laser power is used, the heat could damage the molecules under study. Thus, gold beads would not be useful for temperature-sensitive experiments or applying force to molecules. But the heating effect could be useful in raising local temperatures in certain experiments, such as heating a protein just enough to allow scientists to watch it unfold, the paper suggests.